We provide certified food-grade carbon dioxide (CO2) and mixed carbon dioxide and nitrogen (CO2/N2) to put the fizz behind your bar. Our 10-litre CO2 cylinders operate at the maximum pressure for highly carbonated lagers, ciders and post mix soft drinks. All our cylinders are regularly maintained to British industry standards. Our 10-litre mixed CO2 and pure NO2 cylinders operate at the maximum pressure for perfectly poured lagers, stouts, ciders and ales. All our cylinders are regularly maintained to British industry standards. Our 50-litre mixed CO2 and pure NO2 cylinders operate at the maximum pressure for perfectly poured lagers, stouts, ciders and ales. 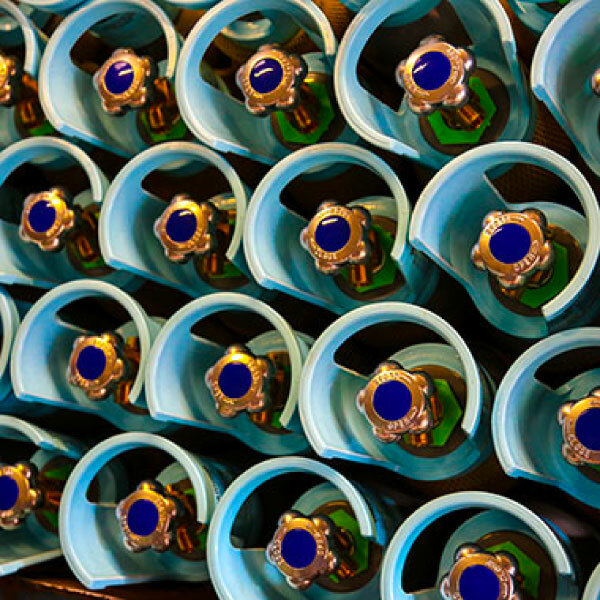 All our cylinders are regularly maintained to British industry standards. We supply and install a range of gas regulators for maintaining carbonation and pressure in the dispense of draft beer and postmix drinks. As part of our service, our team of technicians will survey your cellar and advise on the best solutions. CO2 blenders are regulated to industry standards of 30% and 60%. Our compact wall mounted panels can easily be installed in the pub cellar creating ideal beer dispensing conditions. Reduced handling saves time and improves safety. Our wide range of beverage dispensing systems includes supplying and installing the latest and best industry equipment. Meanwhile our sister company, The Real Soda Company, is a provider of high-quality drinks syrups.